Corfe Bears > Charlie Bears > MINIMO DIAMOND 6"
She is part of the WEDDING BELLES SERIES, which includes TIARA, LACE and GARTER. The Minimo mice have always been very popular and now we are excited to see some more in a brand new mini series called 'WEDDING BELLES'. Each adorable mouse is adorned with beautiful and delicate accessories and represents the traditional things that each bride should wear on her wedding day...... something old, something new, something borrowed and something blue. These cute mice will make an ideal present for a bride or will be the perfect thank you gift for bridesmaids ....... or could be given to celebrate an anniversary..... birthday, etc ...... in fact the list is endless, as they are so beautiful, anyone would be pleased to own them..... even you! They are only 6" (15cm) in size and are made from mohair and luxurious alpaca. These miniature mice will be highly collectable and sought after as they are in a numbered limited edition of only 600 worldwide, so there won't be enough for everyone! DIAMOND has the finest taupe mohair on the arms, legs and head and this is quite sparse, as you can see the darker backing material showing through and she has luxurious pale peach alpaca on her tummy, muzzle and outer ears. 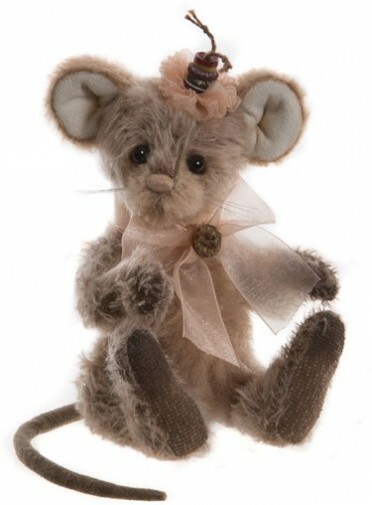 She has a cute peach hand-stitched nose and mouth, tickly whiskers, big ears and a long tail. She is accessorised with a pretty peach headpiece, that is adorned with stacked buttons and she also wears a pale peach organza ribbon that is fastened with a button. Diamond Minimo is a fully-jointed, miniature mohair bear from the Charlie Bears 2019 Minimo Collection.